In this second part of the 2 part course, we will present the most effective treatment strategies from a comprehensive foundation of evidence-based practices, all within the context of the PEOP (Person/Environment/Occupational Performance) framework, from Part I. Our primary focus will be on client-centered, environmentally-relevant interventions that lead to productive occupational performance across the developmental continuum from early childhood to adolescence. Meredith Gronski, OTD, OTR/L, Provides occupation-based evaluation, intervention and consultation to schools and families in the community. She currently teaches content related to children and youth including modules on sensory processing, self-regulation, school-based practice, and feeding development and interventions at Washington University’s Program in Occupational Therapy. She is the faculty lead for the university’s OT community practice; integrating both MSOT and OTD students into clinical program development and outcomes-focused research projects. 1. Identify key components of a holistic self-regulation program. 2. Identify at least 5 evidence-based intervention strategies to address self-regulation concerns. 3. Identify key factors of social cognition that impact peer and caregiver relationships. 4. Describe the impact of environmental considerations readiness to engage in appropriate behavioral responses and strategy use. 5. 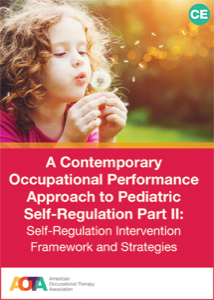 Explain the value and developmental appropriateness of cognitive-based approaches to addressing occupational performance self-regulation outcomes.